Umetarou Nozaki is a talented manga artist who has a lot of passion for his two main characters, Saburo Suzuki and Mamiko. In fact, he is so passionate about manga that his life seems to revolve solely around doing research for it. For example, he loves Valentine's Day because the great variety of chocolates and pretty packaging make great references. 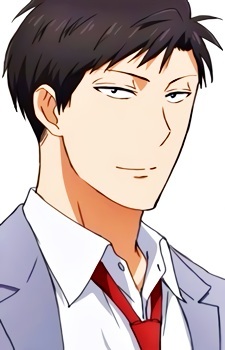 Nozaki is extremely blunt when it comes to things like pointing at a girl's bra and saying that it is showing, and explaining to Sakura that he had never experienced his first love, despite the fact that he claims he is a love expert. He is oblivious and dense when it comes to love and feelings himself, especially those of Sakura. He is so oblivious and dense to the point that he appears silly at times, doing absurd things such as trying on a girl's sailor uniform for research. Despite him being oblivious to Sakura's crush on him, he enjoys her presence and is often seen both around and outside of school with her. He is a manga artist under the pen name Sakiko Yumeno, the creator of the shoujo manga "Let's Fall in Love". This manga is published in a magazine called Monthly Shoujo Romance. In middle school, he was a captain of the school basketball team. His best subjects are Japanese, Japanese History and Home Economics, though he is not very good in Universal History and English. His type of girl are girls who have determination. Moe boys! Is there any other reason to click this article?